Hot weather seems to call for cold dinners like our chilled, herbed tomato soup. 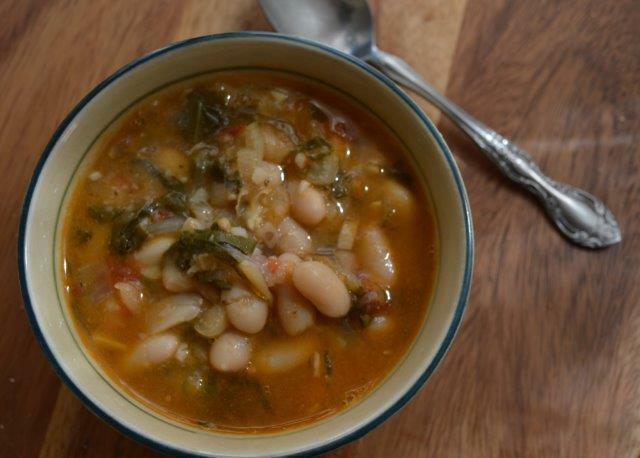 But don’t wait for cooler weather to fix this savory cannellini (white kidney) bean soup. It’s packed with energizing vegetables and protein; filling, but light enough to need rounding out with salad and good bread for a satisfying dinner. If you use canned beans, it will take about 45 minutes from start to serving. If you prefer to cook with dried beans, you’ll need to soak them for at least five hours ahead of time. I prefer to use dried beans, because after all, it’s no big deal to put beans in a bowl, cover them with water, and set them aside until next day. And yes, dried beans take longer to cook – between 1 to 1-1/2 hours. I figure on using the time to get other things done around the house, then set the table, slice bread, and get the salad ready so I can put dinner on the table as soon as the soup is done. But I do keep several kinds of canned beans in the pantry for those times when I need to produce a hot meal quickly,and they make good soup too. You can also substitute a can of chopped tomatoes for fresh ones, but then you’ll need to taste the soup while it’s cooking and possibly add a little brown sugar or other sweetener if they’re very tart. 1 cup fresh spinach or sliced Swiss chard leaves, packed in tightly. Substitute a large, sliced zucchini if you want. Heat the olive oil in the soup pot over medium heat. Add the sliced carrot, onion and celery to the warm olive oil. Cook the vegetables, stirring a few times, until they wilt – about 5 minutes. Add the tomatoes and garlic to the pot. Continue cooking until the tomatoes are soft. Add the beans, salt and pepper, water and bay leaf. If you’re using dried, soaked beans, cook the soup until the beans are very soft – from 1 to 1-1/2 hours. Start checking after an hour. The way to tell if beans are cooked through: spoon a few beans up, with their liquid, and blow on them. If their skins split apart, the beans are cooked; or at least, worth tasting to judge if they need to cook a little longer. If you’re using canned beans, cook for 30 minutes. Either way, cover the pot, bring the soup to a boil, then lower the heat to medium-low. When the soup is ready stir in the spinach, Swiss chard or zucchini. Cover the pot again and cook another five minutes. Taste to adjust seasoning if needed. Serve with our easy, oven-baked Parmesan buttercup squash, and bread, and a chilled white wine. Figs are in season now, so top off the meal with our wonderful figs with arak and cream. Next Next post: Egypt invests in a million public fruit trees!